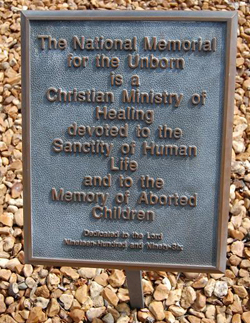 On the very site where Chattanooga's only abortion clinic stood for 18 years – the very place where 35,000+ babies were slain – now stands the National Memorial for the Unborn. 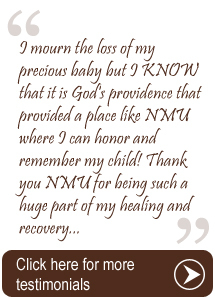 The National Memorial, founded in 1994, is dedicated to healing generations of pain associated with the loss of aborted and miscarried children. Through the years, countless individuals and families have found freedom from guilt and shame and moved toward forgiveness and restoration by honouring their children. The facility houses a "Wall of Names," where anyone who has lost a baby to abortion may come to honor their child and find forgiveness, hope, and healing. And in 2007, the National Memorial began placing brick pavers into the garden to remember miscarried, stillborn, and early infant deaths. 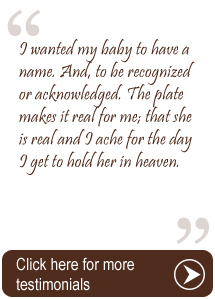 Private memorial services are provided for those who place plates on the Wall of Names or brick pavers in the garden. 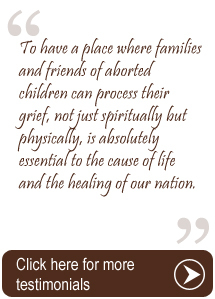 For the National Memorial for the Unborn’s complete history, click Next.